Fading an unwanted tattoo with the powerful PicoSure laser to facilitate a new cover-up design has become increasingly popular. 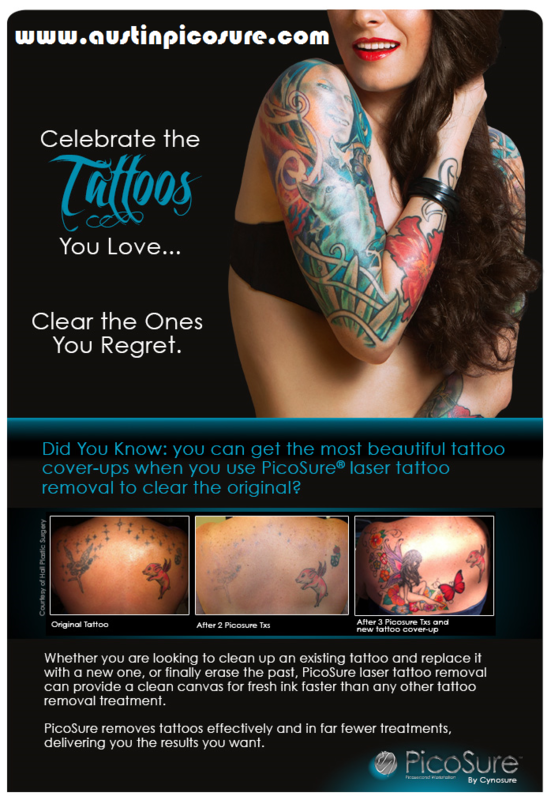 A professionally faded tattoo increases the choice of cover-up art work options significantly. For example, the light bright colors and fine lines associated with today’s tattoo designs will not effectively cover an older existing dark outline and ink. Most dark outlines and deeply saturated tattoos can be sufficiently faded in just one or two treatments with PicoSure but the same isn’t true of a POS Q-switched laser. Once the majority of the undesirable ink has been removed, the artist can then easily apply a new tattoo using lighter strokes and delicate colors. I have faded a significant number of tattoos successfully which allowed for the placement of beautiful cover-up artwork – see example below. If you’ve got a tattoo you want faded or safely, effectively and completely removed with PicoSure I can be reached in Austin, TX @ my new location: Austin Medspa 512-479-9997.